Naniwa Bridge in Osaka, Japan. The bridge spans the Old Yodo River and was completed in 1915. Naniwa Bridge was, and still is, well known for its lampposts and stone statues of lions. It featured impressive stone steps leading to Nakanoshima Island and Nakanoshima Park. When Osaka started modernizing its urban infrastructure at the end of the 19th century, high on the agenda were the construction of a modern harbor, improvement of the Yodo River, introduction of streetcars, widening of Osaka’s narrow streets and modernization of Osaka’s many bridges. As steel became increasingly available, it was gratefully used by Japan’s newly minted civil engineers to build Japan’s modern bridges. 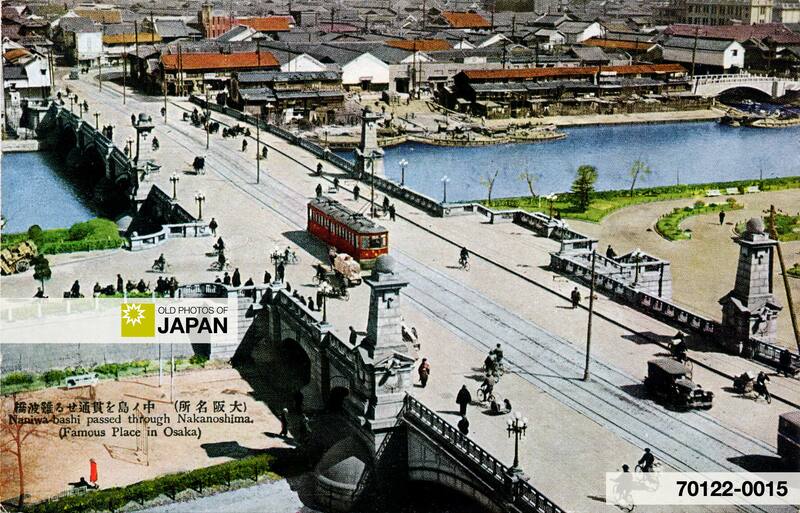 Naniwa Bridge is especially representative of the kind of bridges built during this period. 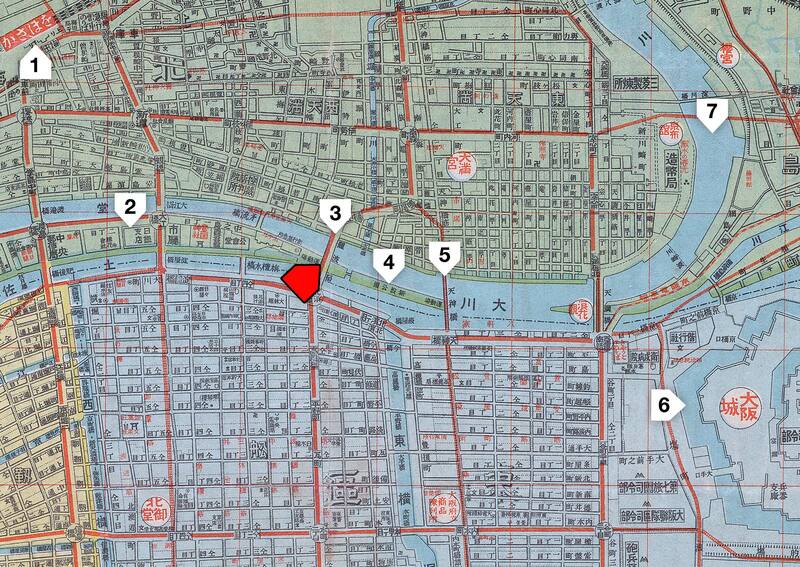 1922 (Taisho 11) Map of Osaka: 1. Oebashi; 2. Osaka City Hall; 3. Yodoyabashi (Yodoya Bridge); 4. Dojima River; 5. Hokoku Jinja (A shinto shrine honoring Toyotomi Hideyoshi. It was built in 1879 and moved to Osaka Castle in 1961); 6. Tosabori River; 7. Prefectural Library; 8. Central Public Hall; 9. Naniwabashi (Naniwa Bridge); 10. Nakanoshima Park; 11. Tenjinbashi (Tenjin Bridge). 1 Matsumura, Hiroshi (2004). Bridges: Highlights of Osaka’s Urbanscape. Osaka City Foundation for Urban Technology, OSAKA and Its Technology, No. 45. You can also licence this image online: 70122-0015 @ MeijiShowa.com.